Winter is joyful, especially when you are eating next to the beach, watching the waves lap the shore. It may be winter but that doesn't mean you have to give up your need for food next to the beach. With so many sunny days of late, it's almost a crime not to make the most of the sun, especially with it still setting relatively early. Here is our selection of some great lunch options to enjoy right now whilst the island is still waking up for the coming summer season. See our restaurant guide for more places open during the winter. La Escollera sits at the top of Es Cavallet and oozes class plus getting there via the salt plains is a delight. Take a seat on the one of the palm-shaded terraces and take a moment to enjoy the view, stretching out to Formentera. The menu is a blackboard, presented to you with gorgeous items like shoulder of lamb or fresh fish baked in salt. Be sure to leave room for one of the “to die for” desserts, the tarte tatin is sensational. Spread out on the soft seat cushions and soak in the DJs Balearic beats for a total chill-out vibe. Tip: If the weather is not kind, the restaurant is equally inviting inside and with the full length glass windows you won't miss out on the views. There is even an open fire to warm you up. Not strictly a beach restaurant, though Hostal La Torre does have one of the most spectacular views of San Antonio Bay around. Perched on the rocks, there's space for dining inside and out. Inventive food is the order of the day and there's a nod to sustainability with a fish of the day, though we like the succulent suckling pig. There's a tapas menu for a lighter bite menu and it's served all day from 13:00. Sitting here in peace and tranquillity, staring out to sea is probably one of the best ways to while away time that we know of. Tip: Get up early and go and breakfast there for a fabulous way to start your winter Ibiza day. There's a punchy menu with everything from tofu scramble to an almost sinful ham and cheese croissant. Beachside idyll Bali Beach has some of the most wonderful views of Playa d'en Bossa beach with a buzzy atmosphere to match The place is open from midday till early evening and offers an excellent value three-course fixed-price menu for just €17. All the food is homemade with love and there's lots of choice with things like Puchero winter stew or Ibizan tomato salad to start or for mains fresh sole in an orange sauce or steak with wild mushrooms. Oh yes! Tip. if you want to avoid the lunchtime rush, go a bit later and soak up the warm and not too hot afternoon sun. Pure bliss next to the beach, rather like a beach club with a brasserie menu featuring fresh and fine ingredients and very pretty food. 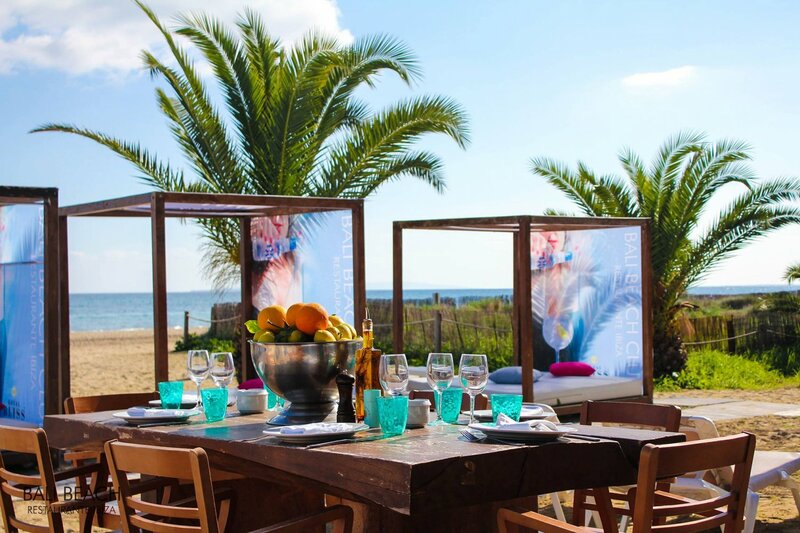 You'll have to wait till March when Chiringuito Blue reopens and it is worth the wait. We particularly like the sharing plates, which could be as simple and heartwarming as a plate of linguini with garlic and chilli or as luscious as the eggs, crispy potatoes and caviar. Nothing's stopping you from going full frontal and diving into some Galician beef or fresh fish. Kids have a good balanced menu too. Tip: the cocktails here are out of this world and there's even some great virgin ones for the designated driver, Virgensita anyone. Mine's a mezcal powered Mad Mex. Just around the coast at Cala Jondal you will find Yemanja serving up tasty dishes every day of the year. This beach takes on a different vibe in winter: forget the rich and famous of summer and tune into a more relaxed and rustic atmosphere. Park easily and make your way through the bar to be met by the inviting tables set right on the sand surrounded by the pine-clad hills. Winter is a great time to appreciate the crystal-clear waters and the slower pace of this beautiful beach. Tip: Start with a selection of breads and homemade alioli (a garlic mayonnaise-like sauce) before sampling one of their incredible and raved about paellas with seafood and shellfish. Sa Caleta restaurant is a former fishermen's shelter that today is a cosy family-run restaurant, with views overlooking the beach and the red stone cliffs. You can choose from typical Ibizan and Spanish cuisine on offer, like monkfish with seafood sauce, different types of paella or the delicious bullit de peix fish stew. A must try is the their café "Sa Caleta", coffee flavoured with a heady mix of alcohol, fruit and spices set alight at your table in a distinctive clay bowl. Tip: Take a stroll to the seventh century BCE settlement, established by the Phoenicians, the people that gave the island its name and try to imagine how life was in this proto Ibiza.